Students and staff from HTW Berlin and University of Zurich are also eligible for the CG member rates shown, but the number of student tickets is limited and sold on a first come, first served basis. While the Monday Evening Reception and Tuesday Evening Public Screening, respectively, are included in your conference fee, you do need separate tickets (free) for entry as pre-registration for these events, also available through Eventbrite (maximum one each per registration). 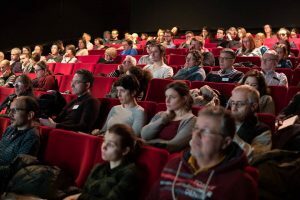 Admission to the Reception and the Screening will only be allowed upon presenting both a Conference ticket and the relevant Reception or Screening ticket.